Is the traditional Christian view of homosexuality out of line with what Jesus taught? BRADES, Montserrat, March 22, 2019 – In recent days, The Reporter has learned of the displayed recent remark by former US President, Mr. Jimmy Carter. Others have said much the same, and the matter must be firmly answered as we address the recent push to homosexualise marriage in Montserrat and other UK Overseas Territories. The basic idea is that Jesus never said anything about homosexuality (or associated topics) so on charity we should just set aside all of that stuff about Sodom and Gomorrah in the Old Testament and dismiss or radically “liberalise” whatever Paul of Tarsus may have written. In the background, is the impression that big-S Science has shown that homosexuals, transgenders and the like were born that way, and that their behaviour does no harm to the community so we should stop stigmatising (“condemning”) them. However, something has gone seriously wrong. For one, any sound Christian will know that “all Scripture is God-breathed and profitable for instruction.” So, if we see someone trying to drive a wedge between Jesus and the Old Testament and also between Jesus and the Apostles he sent out, that is already a direct proof of their serious error. Darkness in the place of light level error. Instead, we are to follow the whole counsel of God’s Word as soundly understood, not what we pick and choose to suit ourselves. That’s why Peter warned against those who would wrench the Scriptures to their own ruin. We must not forget, the radical agenda does not stop at any particular point. If the complementarity of the two sexes is rejected and marriage is redefined as we please, “gender” is up for grabs too. Recall, some of the dozens of “genders” we have been hearing about: “Aerogender: a gender that is inﬂuenced by your surroundings” and “Agenderﬂux: Being agender and having fluctuating feelings of masculinity or femininity, but NOT male or female” – obvious absurdity that disregards our naturally evident creation order. If one claims that darkness is light, he then will claim that light is darkness too. If good is deemed evil, evil will be said to be good. If what is sound is dismissed, absurdity will be proclaimed as deep truth, right and rights. 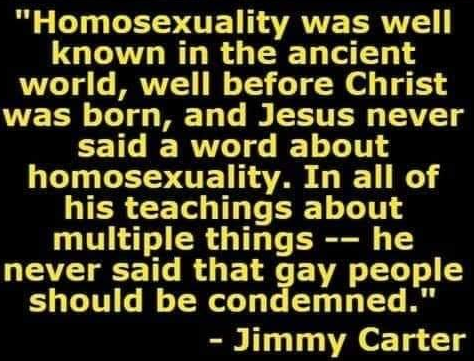 Worse, whoever posted Mr Carter’s claim said, “This is what a real Christian sounds like.” Far from it. Is that where we want to go, here in Montserrat? Birmingham proves that this is what lies down the path the FAC now wants to lead us into. But, but, but, don’t their genes make them do it? “. . . no complicated human behaviour has ever been shown to be actually determined by our genes. We are not mindless robots. The search for gay genes has unsurprisingly clearly failed despite the impressions given by the media and by ill-advised education. Instead, we are responsible, morally governed, conscience-guided. This clearly includes our sexual behaviour: our sexual attractions, acts and habits are under moral government. Of course, our impulses and behaviours can sometimes trap us in addictive, hard to escape patterns of life that are unwise, ill-advised (or even outright irrational), abnormal, damaging, disease-spreading, insanitary, destructive. “1 Cor 6:9 Do you not know that the unrighteous will not inherit or have any share in the kingdom of God? Do not be deceived; neither the sexually immoral, nor idolaters, nor adulterers, nor effeminate [by perversion], nor those who participate in homosexuality, 10 nor thieves, nor the greedy, nor drunkards, nor revilers [whose words are used as weapons to abuse, insult, humiliate, intimidate, or slander], nor swindlers will inherit or have any share in the kingdom of God. 11 And such were some of you [before you believed]. But you were washed [by the atoning sacrifice of Christ], you were sanctified [set apart for God, and made holy], you were justified [declared free of guilt] in the name of the Lord Jesus Christ and in the [Holy] Spirit of our God [the source of the believer’s new life and changed behavior]. [AMP]” “And such WERE some of you . . .” But, by God’s grace, there is hope, there is cleansing, there is transformation. And, that is the genuine gospel message, from AD 30 to AD 2019 and beyond.